It was Napoleon Bonaparte who once dismissed Britain as a nation of shop keepers. He could more accurately have described us as a nation of shoppers. Consumer spending is the driver of the UK's economic growth, accounting for about 60% of all our economic activity. The quickest route to a downturn in that growth figure is consumers who rein in spending. Today's sharp rise in prices (inflation is now at its highest rate for four years) increases the pressure on the just-about-managing classes. And savers, once again, are feeling the strain in an era of ultra-low interest rates. The fall in the value of sterling since the Brexit referendum is the main inflation driver (but not the only one) as it increases the prices of the 40% of food and fuel we import. And all the basics businesses buy abroad to make the things we purchase or provide us with services. Of course, it is not all one way traffic. Sterling's decline is good for exporters and for those global corporations based in the UK which earn a substantial proportion of their revenues in dollars and pay increased dividends to shareholders that include our pension funds. Some inflation can also be good for an economy as businesses tend to invest more if they assume that prices - and revenues - will rise in the future. But the clear and present danger from this inflation spike is for consumers. Which is, pretty much, all of us. Inflation is now at 2.9%, already above where the Bank of England believed it would peak by the end of this year. Income growth is at 2.1%. The incomes squeeze which returned last month has just become tighter. There is some evidence it is having an effect, although consumers have so far been remarkably resilient in the face of rising prices. The latest Visa data on credit and debit card activity earlier this week suggested the first fall in consumer spending in four years. 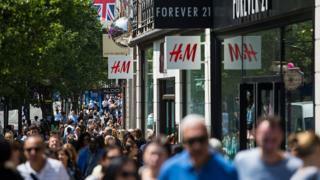 The retail sales figures published on Thursday by the Office for National Statistics will be closely watched. Last month's saw the biggest quarterly fall in seven years, although the figures can be volatile. Behind all this data are the real stories of people who are worse off. Average wage growth masks wide variations, of course. Those in the public sector have seen their pay either frozen - or rises capped at 1% - since 2010. And those people who receive in-work benefits to top up their income have not seen those payments rise. It is into this toxic mix that the question of austerity is thrown - public sector pay and benefits freezes are controlled by the government. Yes, Theresa May can argue that government debts are still rising and that those debts will have to be paid off by future generations. The need for "sound money" still holds sway among many. But, if people feel worse off they tend to look to politicians for solutions. And if there aren't any, they tend to punish incumbents. Since the Second World War there have only been three elections where real incomes have been falling - 1945, 2010 and 2017. None of them ended well for the governing party going into the election - even if they had just won a world war. Nick Timothy, Theresa May's former chief of staff who resigned at the weekend, said voters "were tired of austerity". Today's inflation figure will only make that exhaustion - and pressure on the government to change tack - more acute.